Welcome to the new Runway Inspired Challenge #97. What a brightly coloured outfit? I am a bright girl and I love this dress especially the orange lace border. Love the colour combination of ink blue and bright orange. Here is my card for the challenge. I chose to use the colours together and the concept of lace like orange border on my card. The stamp set I have used for my orange lace border is called Wild Hibiscus. I love this stamp set for its shading on the image. Just awesome. I stamped the flowers all around the white panel. Then I stamp few flowers on scrap cardstock, cut them out and layered over the stamp image on the card panel. 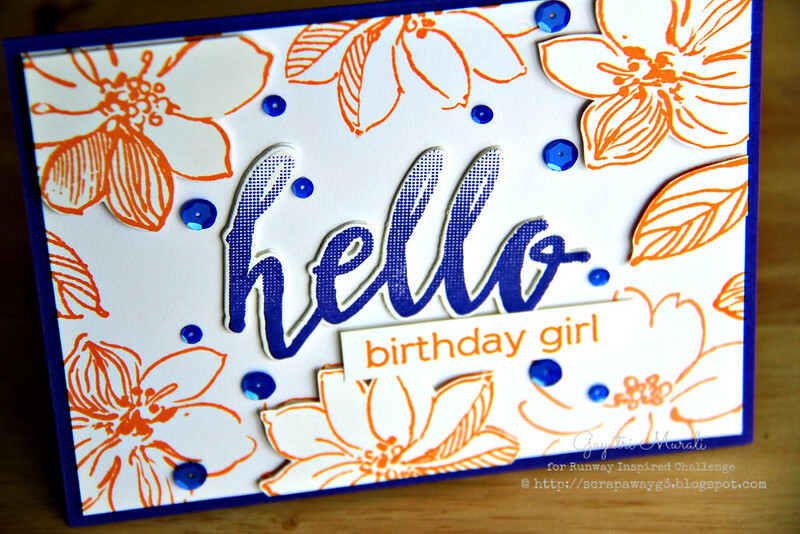 For the sentiment, I stamped the Half tone Hello using Blue Violet Simon Says Stamp ink, then die cut using the coordinating die. 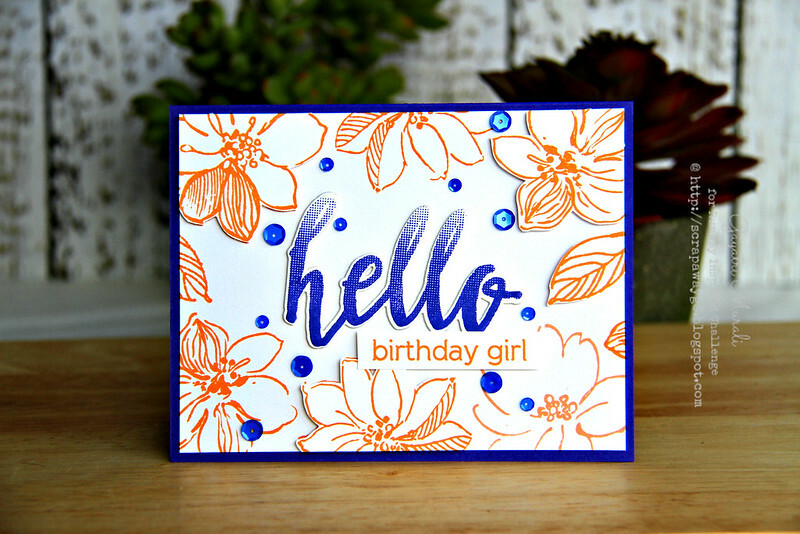 The additional sentiment is stamped on a strip of white cardstock using Orange Soda Hero Arts ink and adhered using foam adhesives. The panel is adhered on an ink blue card base. Finally embellished with Cobalt sequins from Pretty Pink Posh. Hope you like my take on the challenge. Check out Runway Inspired Challenge Blog for more design team inspiration. Come and play along to enter a chance to win $30 gift certificate from Altenew. Great colour scheme. I love the card. Love this Gayatri. The colour combo is great – wouldn't have thought of it myself but will pin it and keep it in mind for projects – very fresh! Eek, I adore this color combo~ Love what you did with it Gayatri!